I first heard of these dogs about 3 years ago, when a Lady named Jeannie Johnson called me & asked if I had any idea what they were. She told me she had gotten them from a 90 year old fellow that had originally purchased them from an immigrant family years ago. The immigrant family he got them from, had traded them for food and blankets many years before, from people that the government were relocating to a reservation. After checking out the date and area, it was clear that this was the Trail of Tears, and it was the Cherokee being relocated with their dogs. A horrible travesty that I believe we all know about, even though it is not covered in our American history books from school. I have seen paintings and drawings of the Trail of Tears …. 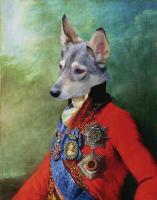 and the dogs in the paintings match these dogs perfectly. 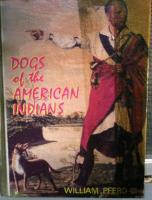 Plus I have old pictures from a Mohican reservation in Main from the 1930’s that are the spitting image of these dogs. Years ago, I managed to get some of the more Cur dogs that looked like this male, from the southeast, that were the old Seminole dogs , and these were gray and black, but mostly black. 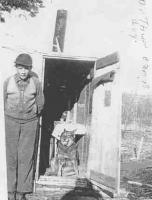 I also tracked some of the Mohican dogs down on a reservation, that an Indian family had, that were pretty inbred ….but before I could get some pups from this pair … some town boys came out, and threw the pups in a river, where they drowned, and the adults were too old to have more pups. What a loss that was, but now I’m so glad to be getting some of these lines back again, through this female’s lines, as well as the southeast lines from the male. We now have a female we call Abby, short for Abyssinian, and a male called Luka. 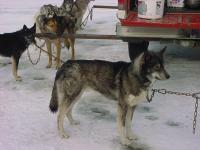 These are the old silver/gray colors with dark black noses, from 17” to 19” tall & weighing from 30 to 40lbs. The 90 year old fellow had been calling them Blue Mountain Shepherds, and selling them as squirrel hunting dogs. They had several unrelated bloodlines when he first got them, and by now there are just 2 unrelated lines, and only a few dogs left. Jeannie bought all of the 30 or so dogs that the old gentleman had. She fixed most of the pet quality one’s, kept the best intact, sold some to squirrel and bird hunters, and small livestock breeders that used them for herding …. they worked out very well for them. Some where bred to other hunting dogs to help bring down the size of their larger Cur hunting dog breeds, that hunters where complaining were getting too big for forest hunting & small game. In all of these “experimental breeding’s” … even though crossed with reds and other colors …. the progeny that were produced were always silver/grays, the only color of these dogs, lucky for us the other colors have been selectively bred out for many years now, and is now a dominant factor in these dogs, along with the dark black nose. These are qualities I am very excited about, as we have been slowly loosing the silver/gray color and some black nose pads, from saving more of the rare dilute colors in our breed. But as I’ve explained ………. beginning to get it back through the new northern lines, and now definitely with these added, “two” new separate genetic lines. As with, all the other types of Indian Dogs from there respective area’s, there are now only 6 of these dogs left, and we now have a male from one of the bloodlines, and a female from the other. Being that they are down to just two separate lines now and only 6 of the best breeding dogs, this type or “breed” can not be continued any longer. So it feels right to both “save them”, and help to add yet another unrelated gene pool to our “mix” or add a little needed salt to our stew, that helps to balance out our AIDog breed. Plus we can give them another gene pool to add to theirs. Since Jeannie has had them she has done DNA testing and checked them for any health problems, as she worked for a vet., at the time. They fell into the same DNA grouped markers as our AIDogs …. and have no known inherited genetic problems. After researching there faults and qualities, I’ve decided to bring them into our breeding program. As with all the slightly differing types I’ve found in the past, they all do have there good traits and bad traits, and as in the past we can selectively breed them in or out. I would like to commend Jeannie for recognizing and saving these old primitive bloodlines, for calling me and asking my advise as to what they may be, and what to do with them. Plus commend, also, the old fellow for recognizing the unique qualities of these rare dogs, and his expertise in genetics and keeping them as close as he could to the old bloodlines, all these years. I will attempt to explain these dogs traits; both faults and qualities, and how they will help in the future balance of our breed. The most important quality is the fact that they give us many new genetic traits and genetic variables within our breed. This is becoming very important as time is making it harder to find new bloodlines of our primitive aboriginal village and camp dogs. They seem to be a combination of the Hare Indian Dog & the Tahltan Indian Dog, with the hair length and texture in-between both. Very much like the small Nordic Vikings dogs that the Vikings brought to the New World two thousand years ago. This is very logical as they were found geologically, in-between these old tribal dogs. Very smart and loyal, small and quick, these dogs are able to change their variable gaits easily, from pacing, 4 beat (or fast walk) to a trot. Used mainly for herding and hunting game in heavily thick treed or forested areas. Both bloodlines are the slightly smaller type common Indian Dogs found originally from Iceland through Canada and Nova Scotia down into the north eastern coastal tribes, Mi’kmaq, Cree, Mohican, Ottawa, Innu, etc …. 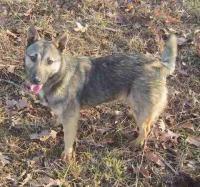 The female even resembles the Icelandic sheep dog, that is a modern off shoot of this primitive type. There has been possible sightings of some of these old dogs on Islands off of Nova Scotia --- seen recently, that my relatives on the Mi’kmaq rez’ are checking out for me. The body type slightly changed as you came down into the central and south eastern coastal tribes, Iroquois, Narragansett, Delaware, Powhatan, and all the way down into the Cherokee, Choctaw, Seminole & Catahoola. The Catahoola Leopard dogs are a modern off shoot of the male Luka’s type , just as many modern breeds --- for instance, the modern Australian Shepherds are offshoots to the Old Pueblo Dogs. Of coarse, the Catahoolas, (as Aussie’s have with the Basque sheep dogs), have been diluted with the bloodlines from the Spanish war dogs and modern hounds. Now, just a very small amount of the old Indian dog is left in them, ….but you can still see a slight resemblance in there, if you know the old personalities and traits, like the flatter forehead, and longer muzzle. He (Luka) has that long bodied, long muzzle look of an old primitive Collie. A very good example is on the cover of Bill Pferds book “Dogs of the American Indians” this shows the smaller size and the longer flatter muzzle traits of those southeastern coastal Iroquois/Seminole types. 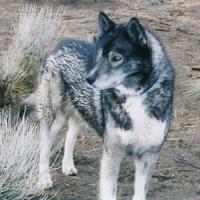 Their size, I consider a very positive and much sought after quality, as we can not find many of the smaller Common, Pueblo, Tahltan, or Hare dogs around much any more. The silver/gray color & separation on the facial mask is also disappearing. So that will be nice to see more of again, within our breed, especially combined with the northern silver/grays that are slightly larger in size ….bringing that size down more, plus bringing out the half horizontal facial mask of both. A good example of this mask is with Shappa, one of the latest keepers out of Feather X Coydo offspring. The personalities of both these dogs are pretty much like our breed; smart, self thinking, happy, wanting to please, and non aggressive towards people and other pets. The negatives are hardly worth mentioning, as selective breeding can take that out with even just one generation. Like the northern lines, the eyes have been bred darker than the original dogs from 500 and more years ago. But when you look close you can see they are more amber brown than the black or dark brown of most modern breeds. This, as I’ve learned from the past, shows me that the yellow eye is just there under the surface, like many other hidden traits, and waiting to re-appear. It comes out with selective breeding in just one cross to a yellow eyed dog, just like the northern bloodlines have. This is one way we can tell from test breeding’s what % is left in them of the primitive breed. This, including the DNA chemical markers, helps put them into groupings of “Modern”, “Re-created" or "Primitive" breeds. The male has a much lighter eye than the female, but slightly longer tail than most I’ve seen now or from the past, although this is a trait of those Old Dogs from there respective area’s. This is another trait that will disappear with just one cross, along with the longer muzzle and flatter forehead. However, these aren’t necessarily negatives as this was there originally within these types, and disappeared when the Plains Indians crossed them into “the melting pot”, of Plains Indian Dogs, as we are doing now. Many of the past bloodlines have also had there negative traits, but through selective breeding, and knowing that the quality or trait we are looking for is hiding just under the surface --- knowing it was there before, so it can come out very quickly again, with what I like to call “breeding backwards”-- I have bred out the negative traits, while confirming the good and historical traits, just as it was done in the "Old Ways", by our Elders, long ago. So all in all, they will both be the salt and pepper necessary to keep those needed variable traits and new genes within our breed. I’m very much looking forward to seeing the result of adding these to our perfect “ultimate mutt” dog stew, affectionately called AIDogs. We will be giving Jeannie some crossed pups back to help her keep her lines going longer also, just as I’ve given the Tahltan reservation some of my lines to help them get there dogs back , as our dogs give to both of them what their dogs have given us, a more varied and healthy gene pool. 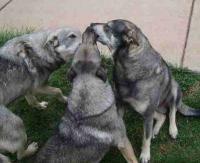 A big “THANK YOU” to Jeannie for finding and saving these dogs, and her help sending us these new bloodlines. 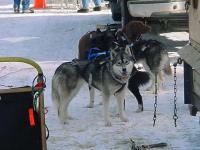 Also to Jan Hall (an AIDog owner in Florida) for her help in putting together the details of communication and shipping. Last, but certainly not least, thanks to Allison Bond for her help editing this article. Can you please ask Kim who the artist is that did the wagon picture on the Trail of Tears please? Will do. Pretty impressive, eh? I live about 30 miles from a portion of the trail of tears. They have a trail of tears pow wow every year i have yet to make it to this pow wow. Maybe one day I will be able to take Tareva and Sassy to it. We took Tareva to one in Nashville and she was a hit. So are these northern blood lines now in the recipe? Looks like the one on the right is the same guy in the village/common section of the song dog site. I don't know why but I'm smitten w/ these types. Are these the ones that are gettin closer to the 40lb mark? They are beautiful. Especially like the silver grey one on the song dog site he or she is my screen saver now. So you're fond of the mask, eh? We've got some of those pups on line with us, and they are so gorgeous. Be sure to tell Kim what you want. He can give you an idea of when he's breeding those lines, and also he can pick the personality you might want. Is he a AIDog? He looks huge compared to the others? He looks like a husky or eskimo dog. But the difference in the ears snout and tail has me wanting to double check. At 1st glance I thought he was a american eskimo or husky but as I looked more just now w/ my son I was stumped. He's gorgeous my son was like "I want one like that or the other one" I think he wants what I want except when it comes to the name....hahaha...cause he's wanted to name all our animals zac. Now pretending like I'm learning something here he looks like he has the Old Village/Common confirmation. Just bigger than any of the other AIDogs I've seen. Anywho josanne and bart your dog is beautiful. 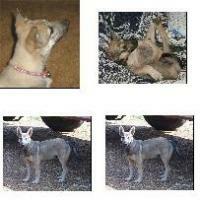 Josanne was sold an indian dog husky mix, by a women who was removed from our breeding program for just that....mixing. You probably can't read Dutch, but poor Chief has hip problems from the breeding. To Josanne's credit, she has done a bunch of rehab with Chief, and he is doing much better. She is a lovely woman, and Chief is an excellent dog. I see you are leaning toward the Northern Lines. Hey wait,.... You live in Georgia don't you? Are you sure you want a dog with that much hair? I'm sure Kim will lead you to some local owners. Once you meet one of our dogs, it will be the personality that you want, and the "look" will come second. I just came back from visiting my father and his new wife. She remarked how when Coyo looks at you, it is like looking at a person. There is that much intelligence in the gaze. He looks into your eyes and tries to communicate. Personality and intelligence..... That is what you really want. Oh I totally agree remember it was wolfes that lead me to find this site. 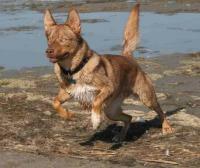 But my screen saver is the beautiful buckskin colored dog half way jumping from the song dog site. I might add it's also the inteligence of thr primitive breed that also drew me here. I agree w/ you 100% I also did get a chance to talk w/ Kim and I like him alot I feel he is a trustworthy fellow and I will start first by placing the deposit and get on a list and then I will wait with patience for the right one. Then hopefully I can take the fam out there to selma and walk the compound. this is the one my son wants....or like it. That's Jake. He's awesome, isn't he? Yes, he is a favorite of everybody. I've got a puppy picture of him that's killer. I'll see if I can get permission to show it. Hello Tammy! Welcome. I understand totally. I waited until everything was right, and got my first AIDog. I was over 40. Now, I only wish I had been more reckless. I could have had several by now. Still, when the time is right, you will know. I hope you will write to Kim, and tell him your story. 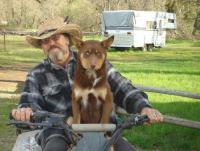 He is a very nice man, and always eager to hear tales of the past, and of people who knew "The Dogs". So are we. Feel free to talk to us, anytime. Welcome aboard Tammy. You are in for the ride of a life time. These dogs are sensational. I waited 19 years, now that was dumb, but alas, there is the right time to have one of these dogs in your life. As Allison said, you will know when that time comes. Then you'll wonder why you waited so long .....Talk to Kim, get on the list, and when the time is right for you, you're ready to go. Jump in with both feet, get wet and I bet you will completely fall for these magical animals like the rest of us. Hey, you could post a "Sunday Afternoon with Grandma" with your history of the Trail of Tears. I'm sure we would all be really interested, and tie it in with the AID's. Looking forward to your posts. Don't wait, these dogs are the most amazing creatures!!! I lost a yellow lab (she was the best...I was pretty down and out) couldn't settle on anything till I found Song Dog Kennels website...Kim is great and so is everyone on the forum. I have been so happy since Chhaya came into our lives....there is none other like the AIDog!!!! Can't wait to hear more on your Grandma and her experiences!!! @Allison - I have been re-reading a lot of these older articles and was curious about something. However I want to say 1st this is just something I was curious about and in no way me any disrespect to Kim or any of his lifes work. I noticed while I read that Kim spoke/wrote a lot about breeding backwards as it related to bringing back the old 'physical traits' but is there any record of their actual working traits? Is it a safe assumption that the old ways of breeding or 'the melting pot' Kim referred to in the above article was breeding for purpose according to the peoples/region/purpose i.e. Herding, guarding as it would relate to alerting and I guess warding off dangerous animals as it would apply to family and livestock, etc. Did the old ways of breeding or pairing of specific dogs allow for sturdier dogs less prone to injury from the physical demands of their roles within the tribe/family? I hope this makes sense. Again I ask out of curiosity and not out of any type of judgement. Wow, Linda that is soooooooooooooooooooooooooo cool. I grew up along the Trail of Tears, and it was a constant presence in my life, like the Ohio River. I looked at Tuscarora words when searching for a name for Danza, but none of the words that really described her were at all pleasing as a dog name. It's good that Snake is going there - it's a place that needs happiness on it.